You are cordially invited to attend a Harmony Celebration as we reflect upon all the growth we have experienced and celebrate with a toast to our future. In 2018, Harmony Senior Services realized that The Crossings brand did not fully reflect their mission, values and the commitment we show to our residents each day. Harmony is the operating company of our community, where we serve seniors with dignity and respect in a residential setting, under the care of professionals. Residents live in Harmony and experience the energy of life. Harmony at Five Forks reflects these values in our employees and their commitment to our residents and their families. 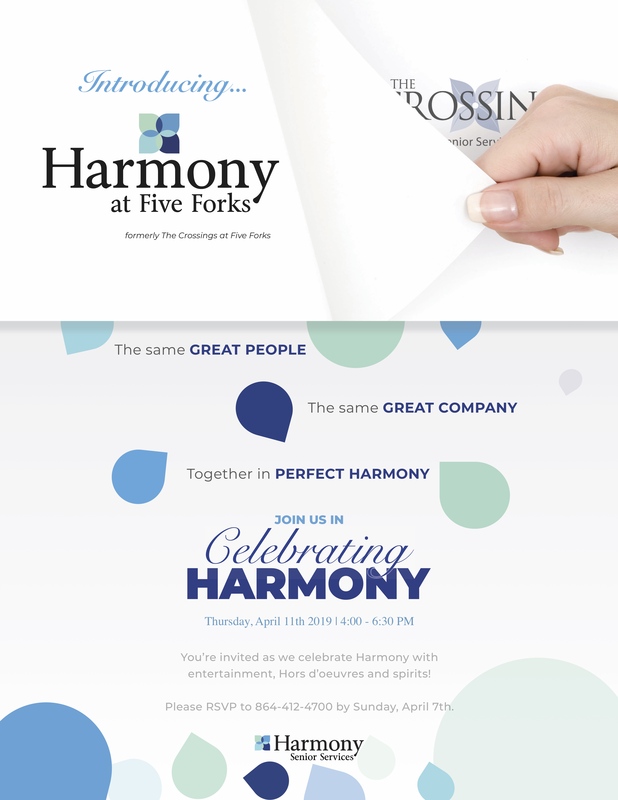 The new brand, Harmony at Five Forks, (effective April 1, 2019) embodies the mission and values of our parent company, Harmony Senior Services. Our community, located at 345 Five Forks Road in Simpsonville, SC will host a Celebration Event on April 11, 2019 from 4:00 P.M. to 6:30 P.M. All are welcome to attend.